Allen L. Milgrom (born March 6, 1950) is an American comic book writer, penciller, inker and editor, primarily for Marvel Comics. He is known for his 10-year run as editor of Marvel Fanfare; his long involvement as writer, penciler, and inker on Peter Parker, The Spectacular Spider-Man; his four-year tenure as West Coast Avengers penciller; and his long stint as the inker of X-Factor. Al Milgrom grew up in Detroit, Michigan and graduated from the University of Michigan in 1972. West Coast Avengers #1 (Oct. 1985). Cover art by penciler Milgrom and inker Joe Sinnott. Milgrom started his comics career in 1972 as an assistant for inker Murphy Anderson. During that period, Milgrom contributed to Charlton Comics' Many Ghosts of Doctor Graves, Star*Reach, and comics published by Warren Publishing and Atlas/Seaboard, before joining with Marvel. Milgrom also worked as a "Crusty Bunker" for Neal Adams' Continuity Associates in 1977. At one point Milgrom lived in the same Queens apartment building as artists Walter Simonson, Howard Chaykin, and Bernie Wrightson. Simonson recalls, "We'd get together at 3 a.m. They'd come up and we'd have popcorn and sit around and talk about whatever a 26, 27 and 20-year-old guys talk about. Our art, TV, you name it. I pretty much knew at the time, 'These are the good ole days.'" Milgrom came to prominence as a penciller on Captain Marvel from 1975 to 1977. He penciled the Guardians of the Galaxy feature in Marvel Presents, which was written by Steve Gerber and Roger Stern. 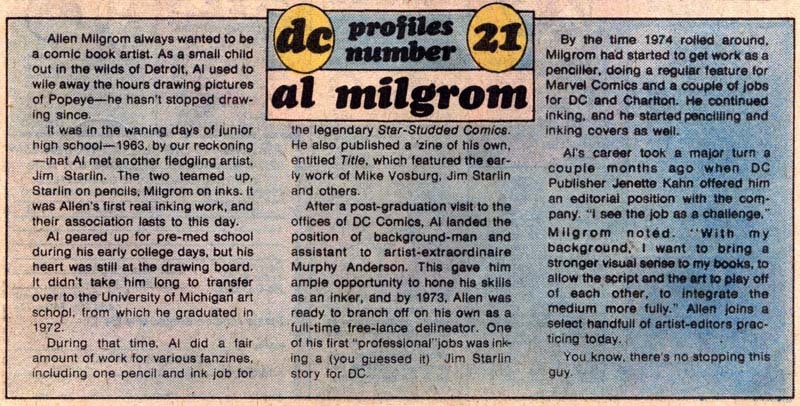 Milgrom worked as editor at DC Comics from 1977 to 1978. While at DC, he co-created Ronnie Raymond, the original Firestorm, with writer Gerry Conway. Milgrom was an editor for Marvel Comics beginning in 1979, and editing Marvel Fanfare for its full ten-year run (#1–60, March 1982–January 1992). As editor of The Incredible Hulk, he designed the costumes of the U-Foes. He drew The Avengers (1983–85), The West Coast Avengers (1985–88), Kitty Pryde and Wolverine (1984–85), Secret Wars II (1985–86) and wrote the Mephisto limited series (1987). Milgrom wrote and drew The Spectacular Spider-Man #90–100 (1984–85), and The Incredible Hulk (1986–87). In 1991, he wrote a story arc for The Amazing Spider-Man and collaborated with Danny Fingeroth on The Deadly Foes of Spider-Man limited series. Milgrom has been a prolific inker, working on most of Marvel's line. He served an eight-year stint as the inker of X-Factor in 1989–1997. He inked Ron Frenz on Thor in 1991–1993 and Thunderstrike from 1994 to 1995. Other series he has worked on include Captain America, Generation X, The Micronauts, and the Uncanny X-Men. Milgrom inked the limited series A-Next, J2, Marvel: The Lost Generation, and Thanos. Beginning in 1996, Milgrom completed his artistic journey on The Spectacular Spider-Man by inking the title until its cancellation in 1998. In 2009, his Cleburne: A Graphic Novel, with Justin S. Murphy, was nominated for the Independent Book Publishers Association’s Benjamin Franklin Awards. In 2016, Milgrom was nominated and tied for runner-up for the Inkwell Awards Special Recognition Award. In 2017, he was awarded a Inkwell Awards Special Recognition Award. Milgrom married Judy Lewin (also from Detroit) in early 1979. They have a daughter, Rachel, and two sons, Ben and Josh. In the film Ant-Man, Scott Lang and his crew stay at the Milgrom Hotel, an homage to Al Milgrom. ^ Bails, Jerry (2006). "Milgrom, Al". Who's Who of American Comic Books 1928–1999. Archived from the original on July 21, 2013. ^ a b "Bullpen Bulletins," Marvel Comics cover dated July 1979. ^ Bails, Jerry. "Crusty Bunkers". Who's Who of American Comic Books 1928–1999. Archived from the original on May 11, 2007. Retrieved June 16, 2012. ^ Warner, Meredith (March 25, 2017). "How Bernie Wrightson uncovered the soul of the monster in his work". Los Angeles Times. ^ Buttery, Jarrod (July 2013). "Explore the Marvel Universe of the 31st Century With...The Guardians of the Galaxy". Back Issue!. Raleigh, North Carolina: TwoMorrows Publishing (65): 26–27. ^ Clancy, Shaun (June 2017). "Marvel Fanfare's Editoria-Al, Al Milgrom". Back Issue!. Raleigh, North Carolina: TwoMorrows Publishing (96): 3–11. ^ DeFalco, Tom "1980s" in Gilbert (2008), p. 199: "Inspired by the 1979 Graham Parker song Waiting for the UFOs, the creation of the U-Foes was truly a team effort. 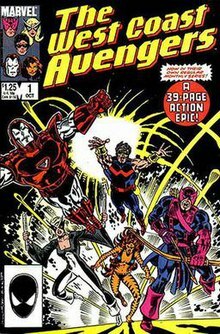 Writer Bill Mantlo and artist Sal Buscema produced the first U-Foes story, but editor Al Milgrom helped design the costumes and Editor-in-Chief Jim Shooter suggested some of the names." ^ Cowsill, Alan "1990s" in Gilbert (2012), p. 195: "Written by Al Milgrom and illustrated by Mark Bagley, 'Round Robin: The Sidekick's Revenge!' was a six-part story that brought back the organization known as the Secret Empire." ^ Cowsill "1990s" in Gilbert (2012), p. 192: "Spider-Man's bad guys took center stage as writer Danny Fingeroth and artist Al Milgrom and Kerry Gammill showed the world from the villains' point of view." ^ "2009 Benjamin Franklin Award Winners and Finalist". Independent Book Publishers Association. 2009. Archived from the original on July 21, 2013. Retrieved April 21, 2011. ^ "Inkwell Awards Winners, 2016". Inkwell Awards. 2015. Archived from the original on August 28, 2016. ^ Shooter, Jim. "Bullpen Bulletins," Marvel Comics cover dated August 1982. ^ Collura, Scott (July 17, 2015). "11 Coolest Ant-Man Easter Eggs". IGN. Archived from the original on July 26, 2015. Retrieved August 2, 2015.